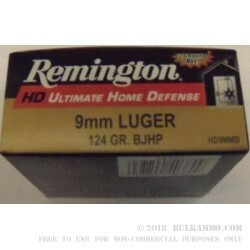 Most 9x19 Luger ammo features a copper jacketed lead core hollow point bullet, but not the most recent Remington HD Ultimate Home Defense cartridges. These rounds feature a Brass Jacketed 124 grain 9mm bullet with a deep cavity Hollow Point design that is cast right into its solid lead core. This hollow point design is such that when it strikes the intended target, it fully expands and travels deep into the tissue to provide maximum stopping power in a small package. 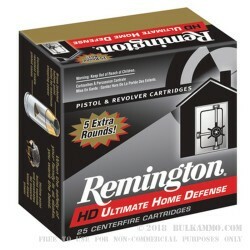 Remington's 124 grain BJHP (Brass Jacketed Hollow Point) round is loaded into a new, reloadable, heavy-duty, thick-walled, Boxer primed, corrosion resistant, nickel-plated brass shells. The muzzle energy these cartridges can produce rates at 349-foot pounds. They also report an impressive supersonic muzzle velocity of 1125-feet per second. 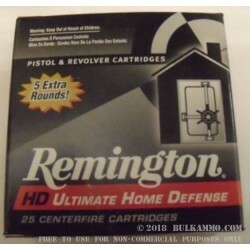 Instead of the usual 20 round box of defensive ammo, these rounds come in a larger 25 round package that is the ideal for loading up your self-defense sidearm, any trip to the range with your family, training at a shooting school, or just plinking with your friends. Aside from FMJ ammo, it is recommended that all CCW-holders take the time and pay the money to train with the defensive ammo that they carry each day. That way, if there is anything you need to adjust for or get used to, you can do it during your training. Grab some today and start bolstering that part of your training. Start now.